Walking in the Hinckley Reservation of Cleveland Metroparks today, the first day of summer, I spotted a group of visitors looking at something along the path ahead. As I drew closer I discovered they were watching and photographing a hawk! The bird was perched upon a signpost and did not appear to be bothered by the attention of nearby humans. Carrying my DSLR fitted with a 400mm telephoto lens, I was able to capture especially close-up images of the beautiful raptor at it watched for people and potential prey. At one point a cicada flew within a couple of feet of the hawk and the bird turned to watch. Fortunately for the insect, it was just a bit out of reach for the hawk and, for its part, the bird seemed to think pursuit wasn’t worth the bother. Turning to watch a cicada as it buzzes by. I left after several minutes of photography, moving around and a bit closer to my subject. Not wishing to spook it into flight, I left the hawk still on its perch from which it could see and be seen. One must look one’s best when posing for photographs! It was too beautiful a day to stay indoors and do the things I ought to be doing, my thinking being I ought really to be outdoors! So off to Hinckley Lake I went for a vigorous hike with full camera backpack — the extra gear adds to the workout. As I was arriving so, too, was a hawk. A young Red Tail? I eyed the bird, within easy walking distance, as I assembled my trusty camera and telephoto. Warily I approached, shooting a photo now and again since each might be the last before the raptor takes flight. The bird stayed put, looking at me now and again, but mostly scanning the ground and sky. Closer and closer I approached in slow steps. The hawk stayed put. I found I could move around under the dead tree perch, even walking directly under my target. How very nice of the hawk to be my wildlife model of the day! Speaking with a Metroparks groundskeeper who was running a mower I learned he had been watching the same bird. It seems this hawk has learned that after the mower cuts the grass, small rodents may appear and are easy to spot in the now-open area! The bird had made a mouse kill just moments before I spoke with the man. The same bird has been spotted following the mower in another park area. A smart bird, and ready for his close-up! Visiting my mother at her home over Christmas holiday, someone began remarking about the many birds that were visiting her feeder… including one large pigeon. The more they described the bird, the more I had to see it. From the window I saw a very sizable bird that was not a pigeon at all but a Cooper’s Hawk! The visit wasn’t for a meal of seeds but likely for a snack of sparrow. 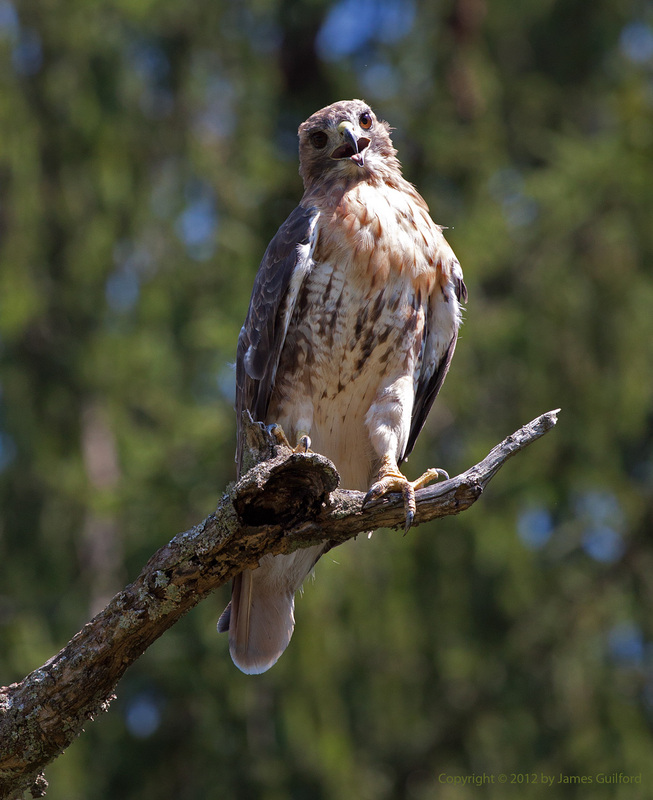 The hawk, perched on a tree limb, hadn’t caught anything; it soon hopped down to the ground just below our window, then took flight, disappearing amongst the trees. Today I received a phone call at the office and, pacing while talking, I gazed blankly out the window then snapped into focus. To my surprise a hawk was perched upon a brick wall but 10 feet away! At first I thought it was another Cooper’s Hawk but began to think that this one may have been a Sharp-shinned Hawk; they can be tricky to tell apart and I’ve only begun to recognize them. Today’s bird, however, was eating. Holding some unfortunate, tiny kill to the wall with its talons, the hawk stripped bits of flesh off and gobbled them down. I find the raptors to be among the most beautiful birds both in their appearance and their flight. They also happen to be among the fiercest predators around. It’s hard for me sometimes to reconcile the two aspects: beauty and slaughter. It is, however, their nature and they must eat to survive. Unfortunately, though my camera was in the room, I was on the phone. 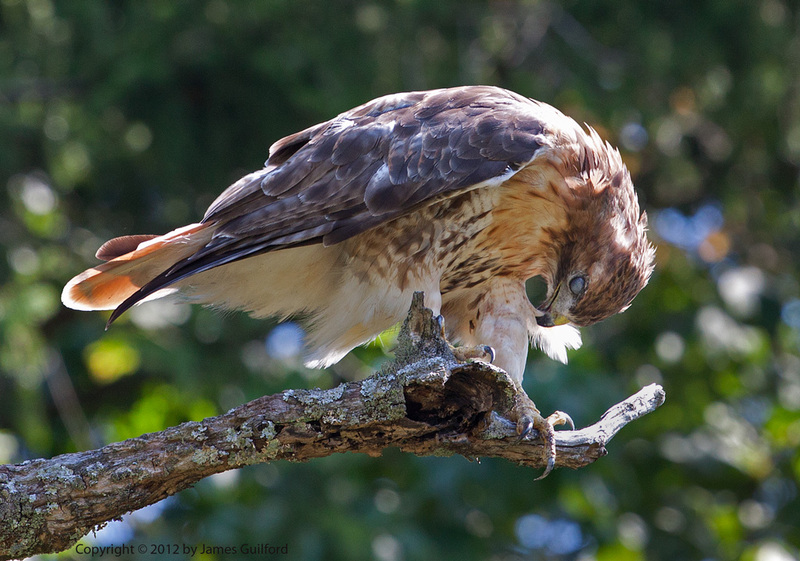 By the time the call had ended and I looked out the window again, the hawk had finished its meal and taken flight. I had vegetarian chili for lunch.